The above video (we couldn’t get through half a minute of it without crying) was posted by Sacramento’s Front Street Animal Shelter last week. 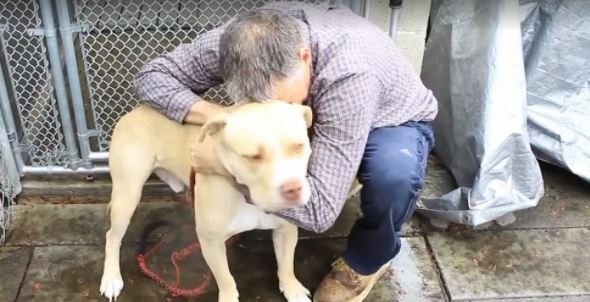 Robert, who adopted his pit bull, Meaty, from the Front Street a few months back, but now — having been evicted from his home — has been having trouble caring for the dog while trying to find a place for his family to live. “My name is Robert, I’m 47 years old, I have a family, a career, a master’s degree, a pet – and I’m homeless,” he says earnestly…. Few shelters allow pets, and so Robert has been sleeping in his car with Meaty. “…because he didn’t want Meaty to be cold and alone,” Front Street wrote in a Facebook post. Robert came to the shelter to try to find a foster for Meaty until the family found suitable housing, but in the process of making the video, shelter manager Gina Knepp, the Sacramento Bee reported, was moved to action, paying for three nights at a dog-friendly hotel to keep them all together. Later that week: even better news. Thanks to the community’s heartfelt reaction to the story, a rental home was found for the whole family! It is just one story in a sea of sad ones. Housing costs in the area are rising faster than many can keep up. Do you live in the Sacramento area? To foster an animal at Front Street, click here! Are You Ready For Baseball Season? This Dog Sure Is! How wonderful to have found a home for the whole family and Meaty! Stories like this are such a ray of hope for everyone. Keep up the GREAT work!